San Bernardino had a Checker dealership that closed down sometime in the 1980s. In the mid 70's, I drove a taxi in Los Angeles. Most of the fleet were late 60's Checker Marathons with (+/-) 200K Miles. They did have a lot of room in the back, as described. Only used the 'jump seats' a few times, but when I did, they came in handy. Sure wish I had one now. I remember talking to one of the mechanics, and he told me they were great. The used Chevrolet engines, but have different other parts. Stuff like a Ford starter, American Motors distributor etc. Those little fold-down seats were fun! Aha! I found the ads I spoke of in National Geographic. They ran through most of the '60s, and I've uploaded one to the Print Media gallery. You can find it here. When I was in high school, I had a girlfriend whose family owned a Checker Marathon with a manual transmission (steering column mounted). It was creamy white, so it was not mistaken for a taxi. I could never guess what model year any of them were; they hardly seemed to change. Maybe because they got it right. They were ideal for taxi service, with all that room. The Checker was built on a truck chassis and the hump that most cars had in the middle of the floor for the drive shaft was not there, so the back floor was almost completely flat. There was a transmission hump in front. They did seem to improve mechanically. In the fifties, some of the older ones sounded like they were laboring through the gears (before most taxis were automatic) but they must have started to use beveled gears by the time this family bought theirs. Their factory was in Kalamazoo. Checkers were noted for having oodles of legroom in the back. In fact, many Checker cabs had additional stool-like seats that could be flipped up from the floor. 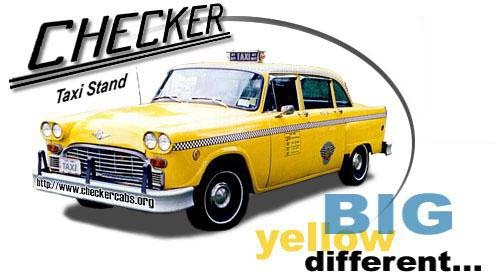 I recall seeing ads for Checker private cars in the back of National Geographic magazines.